Communities along the R510 from Rustenburg to the Limpopo border seeing considerable economic benefits. Workers paving a way for pedestrians. Local SMMEs were used. The repairing and resealing of the R510 which runs from Rustenburg to the Limpopo border, has been completed. The road is now more comfortable for drivers and safer for pedestrians. It has brought some considerable economic benefits to emerging contractors and suppliers in the area. 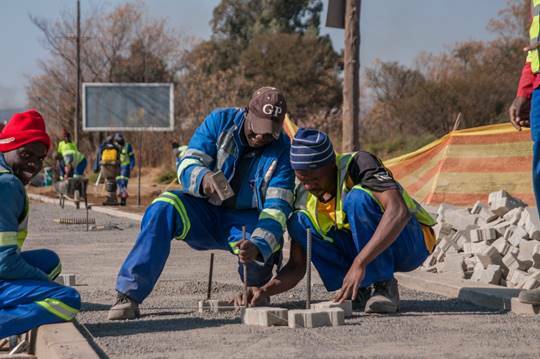 According to South African National Road Agency SOC Limited (SANRAL) project manager Nontobeko Mathenjwa, a total of about R50-million was spent on local small, micro and medium enterprises (SMMEs), and over 100 local jobs were created during the repair and reseal of the road. The safety of all road users, both motorists and pedestrians, was the main purpose of this improvement. The project involved the repairing and resealing of the pavement along the 61km of road as well as the upgrading of three intersections. Two intersections were improved by adding slip lanes and constructing bus bays. A raised pedestrian crossing at one of the three intersections was built to aid school children who cross the road when walking to school. There have been many reports of crashes over the past few years due to bad road user behaviour. “The R510 connects the North West and Limpopo provinces. It is, therefore, critical for us to keep the road in a good condition. We also made the road safer by putting up new road signs, fixing of the edge breaks and shoulders,” said Mathenjwa. Some R142-million was spent on the project, which commenced in November 2016. Speaking about why the agency felt it was important to carry out these repairs, regional manager for SANRAL Progress Hlahla, said: “Our mandate is to better South Africa. We can only achieve this by making sure that citizens are able to get around without a hassle. While the project has made the road considerably safer, the roads agency has requested road users to obey the rules of the road and to be aware of their surroundings. “No matter how many safety features we install, a key variable is road-user behaviour. During this project we saw horrific road-user behaviour which led to several fatalities,” said Hlahla.